Defining the relationship, commonly known as DTR, can be an anxiety-inducing topic for many people. In a world filled with hook-ups, casual dating, friends with benefits, open relationships and committed ones, it’s so important to be on the same page when it comes to where you and your love interest stand. We know this topic can be tough to bring up and even harder to navigate the conversation once you do, so we spoke with Dr. Patrick Wanis, relationship expert and author of Get Over Your Ex Now! and The Breakup Test, about seven ways to define the relationship. With these steps in mind, you’ll better navigate the rough waters of dating and DTR once and for all! One of the most difficult parts any relationship or sort-of-relationship for many is clearly stating what you want. However, Dr. Wanis really emphasizes that it’s absolutely necessary for you to speak up for yourself and say what you want out of the relationship. There are many types of relationships out there, but if exclusivity is something you want out of your current relationship, it’s just something that needs to be said. Emily Schmidt, a sophomore at Stanford University, offers her experience in speaking up about her expectations. It can be scary to speak up for yourself and ask for what you want at times, but you'll never get what you want if you don't ask for it! Whether it be openness, exclusivity or somewhere in between, you’ll ultimately want to ensure that you and your love interest are on the same page. Taking a stand and making it clear from the get-go what you expect out of the connection you have can really save both of you a lot of headaches and heartbreaks later on. While it’s important to make it clear what you want from the relationship right away, even when they’re not quite willing to define it, it’s also equally as important to be honest with yourself on what you’re okay and not okay with. Dr. Wanis explains that you’ll want to ask, “What am I willing to give to this relationship, and what will I accept and not accept from my partner?” in order to decide what is best for you. If you feel that your relationship is not exclusive, then it’s a good indicator that you’ll need to be honest with yourself and ask the tough questions. At the end of the day, it’s up to you to figure out what you’re willing to give and accept—just don’t sell yourself short! Terms aren’t just for legally binding contracts! They exist in any and every type of relationship whether you know it or not, and they need to be discussed if you’re having trouble to DTR. Just as asking yourself whether you’re okay with each other having multiple partners or not, for example, that also doubles as a specific aspect of a relationship that needs to be up for discussion. If your love interest isn’t willing to DTR, then you should at least ensure that you have agreed on a set of terms, including commitment, exclusivity or openness. 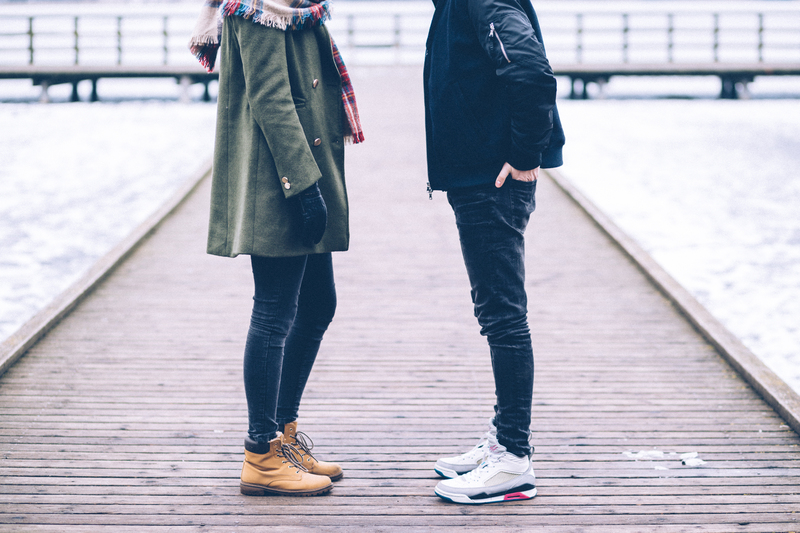 While it can be extremely frustrating to be involved with someone who won’t budge on defining the relationship, understanding where they’re coming from can typically shed some light on the situation. Chelsea Jackson, a junior at Iowa State University, offers up her advice as someone who’s afraid of commitment. “Seeing as my hatred for that dreaded DTR talk stems from my phobia of commitment, I feel like having a discussion about why the person you're seeing doesn't want to DTR could be helpful for both parties,” says Chelsea. Do you catch a running theme here? Everyone has their own story, so really taking a moment to stop and understand a different perspective can help ease some frustration that you probably have. Life happens, and commitment can be scary, especially for those who struggle with it or have had bad experiences with a past relationship. After all, we’re only human, and our own thoughts and perspectives are what make us individuals! Now that you’ve thought long and hard about what you want and what you’re willing to accept from your relationship, it’s now time to question whether the relationship is worth it. It’s certainly not easy, but just know that your time and worth are major priorities! “If he or she isn't willing to abide, you've got to question whether the relationship is worth your time,” says Emily. You’ve already been real with yourself about what you want and expect from the relationship, so you’ll have to take that next step further and truly define your idea of self-worth and what type of relationship is worthy of your time and commitment (or lack thereof). Commitment – it’s the C word that can send many running for the hills. If you still can’t decide whether your love interest is committed or not, even without your definition, you’ll want to consider what exactly avoiding that definition could actually mean. As Chelsea mentioned, commitment can even be considered a phobia for some. So if your love interest isn’t willing to define anything, it may be safe to assume that they’re struggling with the commitment aspect of it all. “I really sincerely believe that if someone refuses to define a relationship it’s not because they don’t want to be labeled, it’s usually because they don’t want to commit,” Dr. Wanis continues. Commitment is a major, if not the most, important component of a relationship, so if you can pinpoint your love interest’s commitment, or a lack thereof, it can become easier to decide if commitment is what you’re looking for. Okay, so, you’ve spoken up for yourself. You’ve asked yourself the difficult questions. You’ve discussed terms. Ultimately, how do all these steps help you deal with someone who isn’t willing to DTR? Essentially, this process is the key in deciding on whether it’s time to stay together or walk away. “Get clear about what you want, and if [they don’t] want to give you what you want, then you have to be willing to walk away from the relationship,” Dr. Wanis advises. Although it’s super tempting to stick around and hold onto the hope that maybe they’ll change or eventually want to define and label an exclusive relationship, that doesn’t always happen. Walking away from a relationship that probably won’t change will not only spare your feelings in the end, but it’ll also allow you for more time to seek out what you truly want from someone else. Your happiness is everything, so if the stress of defining your relationship is weighing you down, you do have options. Defining the relationship is not something that comes easy, and that’s okay! Relationships are messy, and rarely anything that is worth your time is easy. Just always keep in mind that there are actions you can take when you find yourself lacking definition in your current relationship, or whatever you’d like to refer to it as, and if you find that your needs aren’t being met and that you’re not happy, then walking away may be the easiest way to deal of them all.